CNG Truck travelling around Dublin City Centre. Picture Colm Mahady / Fennells - Copyright© Fennell Photography 2016. Compressed natural gas and renewable gas sources are being introduced for trucks, vans, and buses, in what is being called a transport revolution. 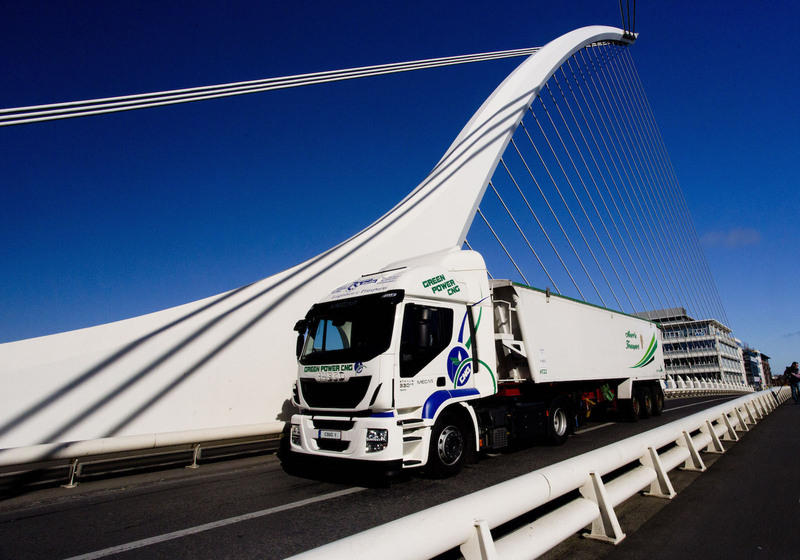 The Causeway project will deliver a clean energy project for Ireland’s transport sector, and in doing so, will provide a template for the rest of Europe. NUI Galway, working with Gas Networks Ireland, is leading the dissemination element of the €25 million project. The project will be monitored and documented and the research will then fed back to gas operators across Europe, and facilitate similar green energy developments across the continent. The ‘Causeway’ project will support a nationwide rollout of 70 compressed natural gas stations and a renewable gas injection facility, which will be built in 2018. This will be the first time a renewable gas will be introduced into the natural gas network. The project received approval for €6.5 million co-funding from the European Commission. It also marks the first time that NUI Galway has been successful in securing a funding application from the European Union’s Connecting Europe Facility. “It is particularly important that the advances we are making through this project, and through the work of NUI Galway, will play a role in changing the transport landscape throughout Europe,” O’Sullivan added.